The Early Years phase is an important time in a child’s development and learning. It is at this stage that exciting developments take place. Therefore, it is exceptionally important to ensure that the needs of all children are met. It is crucial that the likes and dislikes of children are taken into account as well as their fears, interests, medical requirements and health and safety. But how is this planned for? 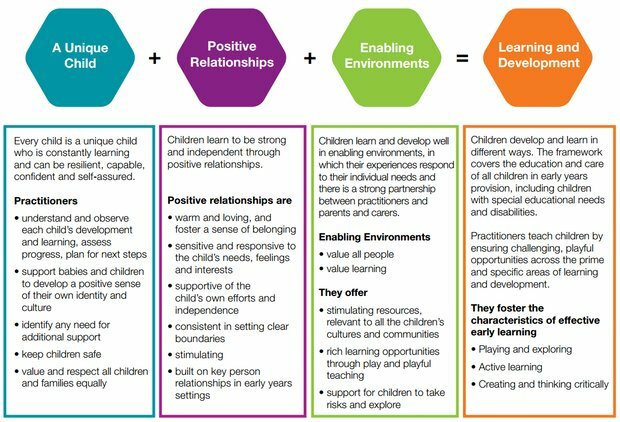 There are four main principles within the Early Years framework. Each one makes clear that it is essential for practitioners to plan appropriate activities based on the needs and interests of all, ensuring that all areas are covered and planned for appropriately and effectively to ensure progression. Take a look at this extract from the document. Notice how all four themes focus on independence and the need to plan for the needs of individual children. Personalised learning allows the use of a variety of different resources, within a wide range of learning environments, and ensures that all children’s abilities and needs are met. This is key to planning a range of activities to enable children to focus on their individual likes and interests. Child-led play is an important feature in this, as well as the provision of a flexible learning environment. However, it is crucial to take into account the diverse backgrounds the children come from as this will break down barriers to learning, as well as creating an atmosphere of mutual respect and care.